Was the Wicked Witch of the West really wicked, or was she the innocent victim of a corrupt regime? Wicked is a cultural phenomenon. A legion of, often young, fans adore the show. Indeed, the one phrase I heard repeatedly as we left was "I need to see it again, lets get tickets." This production is making its final visit to the North East as it appears in Sunderland until the end of September. A number of performances have very few tickets left and based upon this show it is easy to see why. So what is the fuss about? Remember The Wizard of Oz? Well have you wondered about the back story of the good witch and that one with the green face? 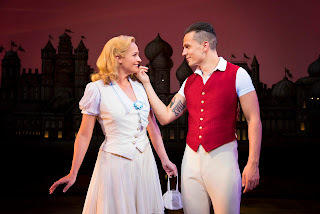 Wicked explains what was happening in Oz before Dorothy dropped in and skipped along the yellow brick road. In the beginning, the Governor (Howard Ellis) and his wife (Sara Morley) have a baby. 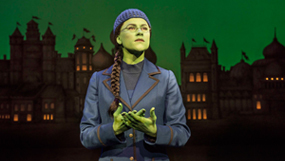 The celebrations are quickly subdued when the child, Elphaba (Amy Ross) turns out to be green from head to toe. 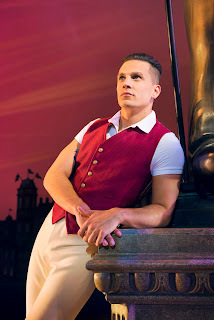 Later they have another child, Nessarose (Emily Shaw) who has the same skin colour as the parents but is wheelchair bound. The two daughters start Shiz University together. 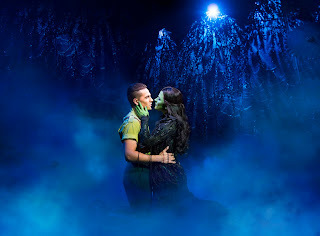 Except that, in her father’s eyes, Elphaba's primary role is to care for her sister. 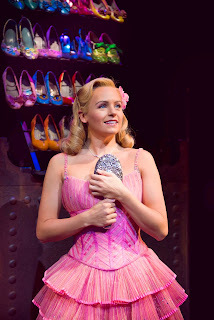 When they start uni they meet Glinda (Helen Woolf), the all popular alpha female who always gets her own way. By a quirk of fate Elphaba and Glinda end up as room mates and so the rivalry begins. This is not helped by Elphaba getting private tuition on sorcery from Madame Morrible (Kim Ismay) at the expense of Glinda. Both girls hope to eventually meet up with the wizard (Steven Pinder) but a lot of obstacles are in their way – especially if you’re green. The magical experience begins when you arrive in the auditorium. A huge Dragon above the arch is spread across the width of the stage staring down on the audience below. 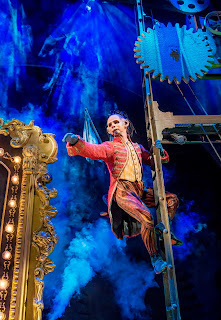 This is part of a fabulous set design from Eugene Lee (set) and Susan Hilferty (costumes). The show has a feel of the ‘west end in the North East’. Added to this is a nice steampunk feel which fits in well with the story. This is especially so when the wizard appears at Emerald City. The special effects are nice too and they add rather than detract from the action. Glamour aside, it is the casting that sets this production of Wicked apart. 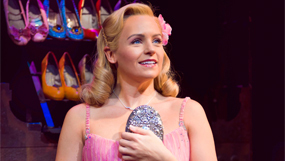 Helen Woolf’s Glinda is suitably self absorbed and egocentric at the start. Amy Ross’s Elphaba warms the audience from the start. There is a great chemistry on stage between the cast members. The songs by Stephen Schwartz help glue the action together. Amy Ross gets an opportunity to shine starting with a great ‘I want’ song The Wizard and I and then closes the first act by hitting great heights with Defying Gravity. Helen Woolf duets with Amy and their voices combine well. The singing is accompanied by a large live orchestra, under Musical Director Dave Rose, who added vitality to the proceedings. The pace was even, so we could follow the story by Winnie Holzman, based upon Gregory Maguire’s novel Wicked: The life and times of the Wicked Witch of the West. Director Joe Mantello creates a delightful musical tale. The choreography from the talented ensemble adds to the feel of the action. The sound design from Tony Meola ensured that there were no problems hearing what was going on. The fans were loving it. 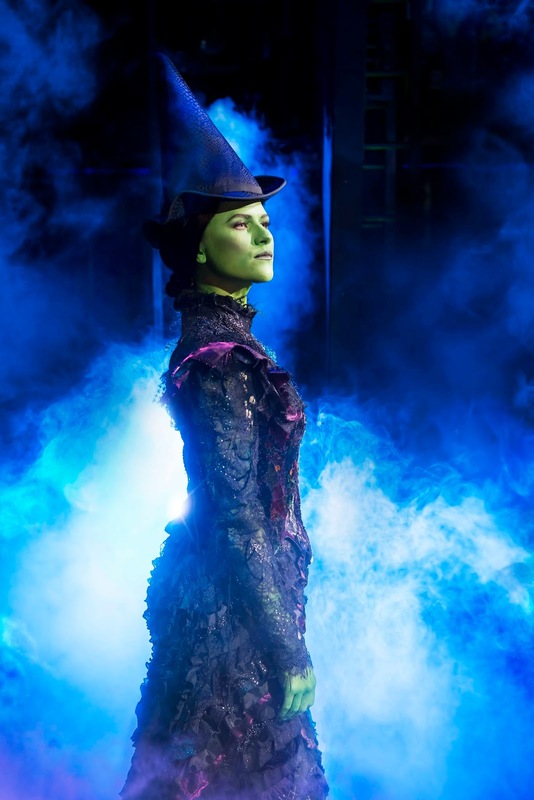 A young girl squealed 'its Elphaba' behind me as the green one appeared for her first day at school. Indeed it was a standing ovation at the end of the 2 hour 45 minute show. It is easy to see why 55 million people around the word have seen the show. It is charming and entertaining. As we left there was one topic of conversation. We were surprised that we loved it so much and, yes, it is the best musical that we’ve seen in the North East so far this year. Some seats are still available from Monday – Wednesday performances. 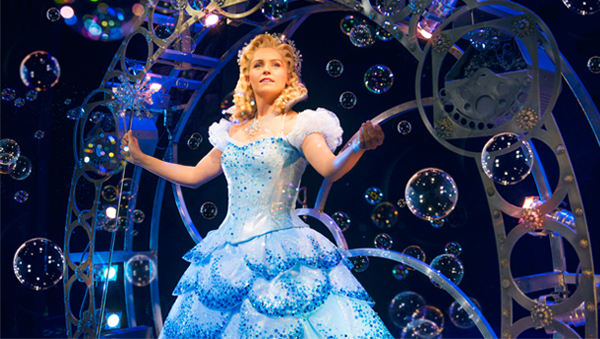 Check for returns, single seats and standing tickets for weekend performances. Tickets from £17.50.